Five days ago, we could not imagine that the Violet Oon Singapore space at the newly-opened Jewel Changi Airport would look like this. It was not ready. “I’ve been here every day for a week, making sure this happens. Sitting here, checking on everything, refusing to head home! The contractor is pretty much my best friend now,” says Tay Su-Lyn, creative director of Violet Oon Singapore, and daughter of its eponymous founder. But on the evening of the Tatler Fashion Awards, the restaurant was completed and looking absolutely on point, and our florist Beato had transformed it further into a true-blue neon jungle—the theme this year—with the most colourful of flora and fauna that covered tables, walls and our photowalls. It was almost a replica of the greenery that surrounded the iconic and magnificent man-made fountain at Jewel Changi Airport—but on acid. When the guests came streaming in, they got the (truthfully, difficult!) dress code spot on. Our themes may not be run-off-the-mill, but it shows that when we throw our Tatler friends a challenge, they deliver. Tatler Fashion Awards 2018's Classic Dresser Carmen Ow came in a highlighter-bright Balenciaga knit top with a white silk feathered pouch she affectionately called her bird. Sammi Lin arrived in a Prada ensemble featuring a neon green tie-dye “stain”. Tan Min-Li rocked up in a Dion Lee cut-out dress, while Shabnam Arashan wore a tongue-in-cheek neon-squiggle gown by Moschino. We also had four guests who turned up in Gucci’s one-shoulder 1980s-inspired printed bodysuit—each wearing it their very own way, which we thought was absolutely brilliant. Shout-out to the men too: We barely saw a black suit—there was baby pink and purple velvet spotted, and Anthony Yong in a head-to-toe Versace print. From Violet Oon Singapore, we had both Violet Oon (the Neon Nyona turned up spotting neon earrings paired with her chef’s uniform) and business partner Manoj Murjani to kick-off dinner with a little chat with host Bobby Tonelli. “It was time for a true Singaporean brand to elevate local cuisine,” Manoj said, in reference to Violet Oon Singapore’s expansion. Singapore Tatler Award for Culture recipient in 2016 chef Violet Oon, pointed out that she knew the father of 2019’s Stylish Man of the Year, Mervin Wee—Jolly Wee, as he himself was a pioneer of Peranakan cuisine. Plus, the elder Wee’s wife has a very similar-sounding name to her: Violet Foon. As a crowd started to build outside the restaurant—let’s not forget it’s the very first day of Jewel Changi Airport's opening preview—curious onlookers (which often peeked in through the glass throughout the evening) started taking pictures of the models waiting outside the restaurant for the Christian Dada fashion presentation. Joining the models were Tatler society friends like Paulina Bohm’s daughter, Anabelle Bohm (who currently models, though this was her first runway show), Angela Ng’s daughter Adeline Yeo, and Tatler Fashion Awards 2018's Most Stylist Woman recipient Yenny Then, whose purple hair and feline features made her look like an anime character. The models strode in, to the soundtrack of Knight Rider and the uproarious cheers from the crowd. The biggest rah-rah was for Peggy Jeffs (whom everyone calls Auntie Peggy), who sauntered in looking just incredibly cool in streetwear, no less. “When I grow up, I want to be Auntie Peggy,” said 2018’s Tatler Fashion Awards Style Disrupter Fanty Soenardy—and basically everyone else. Then it was time to celebrate the Tatler Fashion Awards 2019 awardees. This time round, we did things a little differently by asking our society friends to introduce the winners. 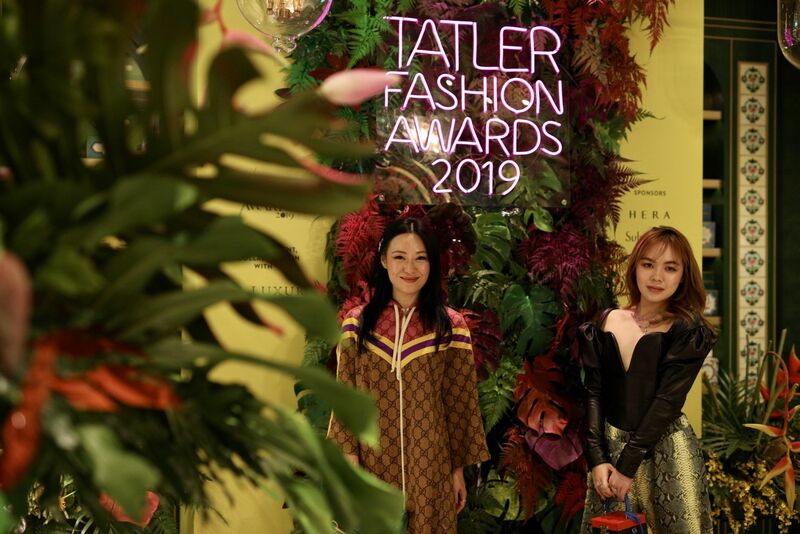 The first award for the evening was Fashion Newcomer, and the first-ever recipient of this same award when Tatler Fashion Awards launched in 2017, Dawn Koh, came up to introduce the winner and her good friend, Chloe Ng. Chloe’s outfit? A leather puff-sleeved top from Saint Laurent, and Off-White pants from the men’s collection—reminding us how well she combines runway, streetwear and menswear all at once. Most Stylish Woman 2017 Stephanie Lee introduced Nancy Ong who looked resplendent in a classic-but-subversive dress by Prada (of course). Things took a slightly emotive turn when Rachel Wee took the mic to do an introduction of her father (and winner of the Most Stylish Man award), Mervin Wee. Rachel spoke of how her dad’s humble beginnings contributed to his love of oversized, baggy clothing, because he only received two outfits every year and they were the biggest possible size so that the outfits would have more mileage. Rachel kept her participation as a surprise for her father, who admitted to us later in the night that he had kept his sunglasses on because his tears were welling up. And that’s a great reminder of what fashion (and food) can do: it stirs up emotions from within, emboldens people and brings friends and families together. Tatler Fashion Awards is an Access event, in collaboration with CNA Luxury.